This Jewelry Armoire is handcrafted in the timeless Mission style. Our Mission Jewelry Armoire is Amish handcrafted in the USA! This is the perfect gift item for that someone special in your life! 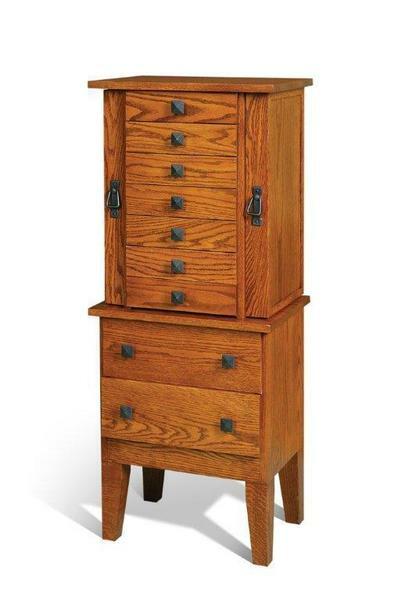 This well-detailed Amish Furniture Solid Wood Mission Style Jewelry Armoire stores all of your jewelry in one location. With numerous drawers and sides that open for hanging necklaces, you should never run out of space It is available with hunter green or burgundy felt. With the Amish Furniture Solid Wood Mission Style Jewelry Armoire you can conceal your jewelry in a piece of furniture that you’ll always want to show off. The top drawer is false and doesn't open. The top of the armoire has a lid that opens with a mirror. There is felt lined jewelry divider in this area. The next two drawers also have felt lined jewelry dividers. The other four smaller drawers are lined with felt. The larger two bottom drawers are plain wood inside with no felt. Call today for more information on our Amish Furniture Solid Wood Mission Style Jewelry Armoire! Oak Photo Shown in Harvest Stain. Cherry Photo Shown in Harvest Stain.